Congress' chief spokesperson slammed the Uttar Pradesh chief minister of summoning the slain policeman's family to meet him instead of going to their house. NEW DELHI: The Congress on Friday attacked Yogi Adityanath over Hindu Yuva Vahini's reported announcement of Rs 10 million bounty on Punjab minister Navjot Singh Sidhu's head, alleging that the Uttar Pradesh chief minister was behaving like "Aurangzeb", and asked whether a "Talibani system" will prevail in the country. The Hindu Yuva Vahini, a right-wing group founded by Adityanath, reportedly announced a reward of Rs 10 million to anyone who beheads Sidhu. 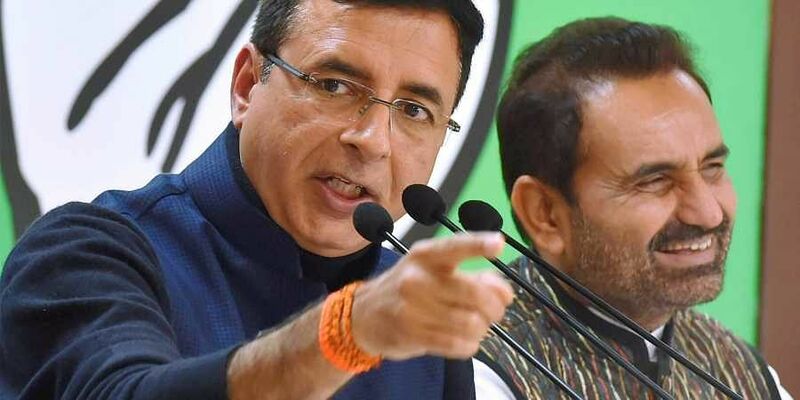 Congress' chief spokesperson Randeep Surjewala, responding to a question, said: "Is democracy left in this country, or he (Adityanath) has now become the biggest Aurangzeb. Modi ji behaves like Muhammad bin Tughlaq and Adityanath ji behaves like Aurangzeb. So, will there be rule of law in this country, will the Constitution govern the country, or will there be open hooliganism, which we saw in Uttar Pradesh?" "Now, the reward is kept for cutting off people's head. The question is that will this Talibani system run in the country, which BJP wants to implement, or democracy," he asked. The tragic part is the manner and fashion in which Subodh Kumar Singh was mob-lynched, shot dead, attacked, in Bulandshahr, he said. "Why was Adityanath ji enjoying 'kabaddi' matches as Subodh Kumar Singh was being shot dead. Why was he on a 'chunavi bhraman' (poll campaign trip) from one state to the other," Surjewala asked. He also slammed the Uttar Pradesh chief minister of summoning the slain policeman's family to meet him instead of going to their house. "In certain parts of our country, the family members do not leave the house till the final conclusion of the rituals which are considered pious in our religion... Aditynath ji should have known that, he violated that also and summoned the family like Aurangzeb to his residence," he said. Surjewala also attacked the prime minister for not going to Singh's house and sharing the pain of the family. Congress party should avoid comparing PM and UP Chief Minister with Muslim Kings like Tuglak and Aurangazeb . Muslims may get angry with Congress and Congress may lose minority votes. Congress leaders should be careful . Ha Ha - ... But Con-gress can still celebrate Tughlaq and Aurangzeb centenary Jayanti - along with Tipu's in Karnataka !! Secular policies of Con-gress can only produce Tughlaqs and Aurangzeb. So dissolve Con-gress party - as per wish of Mahatma Gandhi.